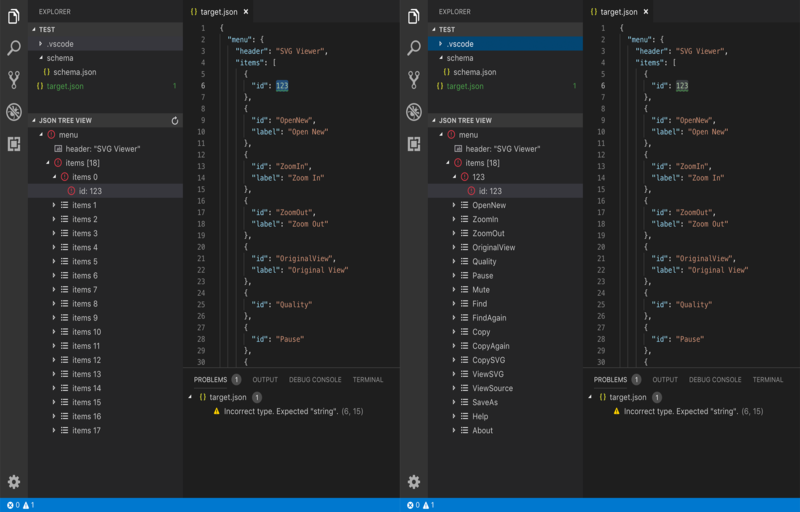 Visual Studio Code>Other>JSON Tree ViewNew to Visual Studio Code? Get it now. A tool to generate JSON tree view from JSON file, integrated with JSON schema validation and customized tree view configuration. Follow instructions on https://code.visualstudio.com/docs/languages/json to set up json schema files. To enable customized tree view, in user setting you need to specify the key of the object you want to customize and speicify which children's key you want to use as identifier. E.g. Open folder ./demo in Visual Studio Code, and open file target.json in text editor, you will find errors are highlighted.